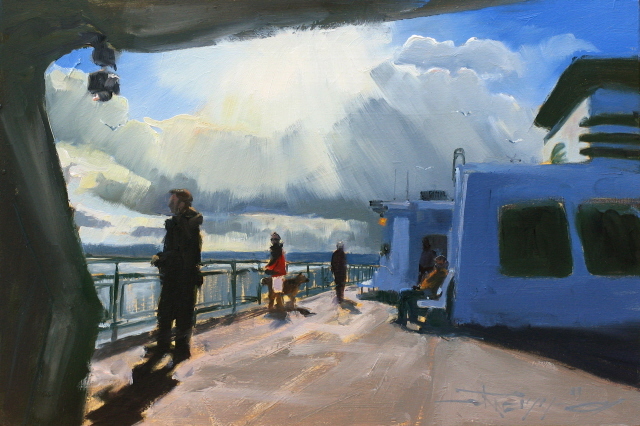 A very familiar view from the top deck of the ferry for those who commute or ride the ferries regularly here in the Pacific Northwest. As the sun goes down at Pike street market in Seattle, vendors try to attract the last of the tourist dollars. "Stormy Day on Alki" Seattle city scenes, cityscape oil painting. We get down to Alki a lot more than ever now that the gallery there has been exhibiting my paintings.There are some great views of Seattle across the water and the atmosphere is always changing , sometimes very dramatically!.. 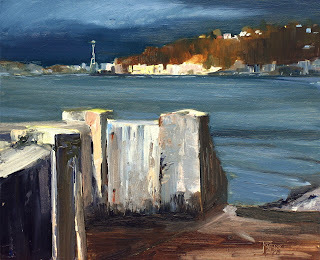 If you get the chance to come to Alki Beach be sure to stop in Alki Arts and say hello to Diane. She will be glad to show you all the work that the many talented artists have on display. 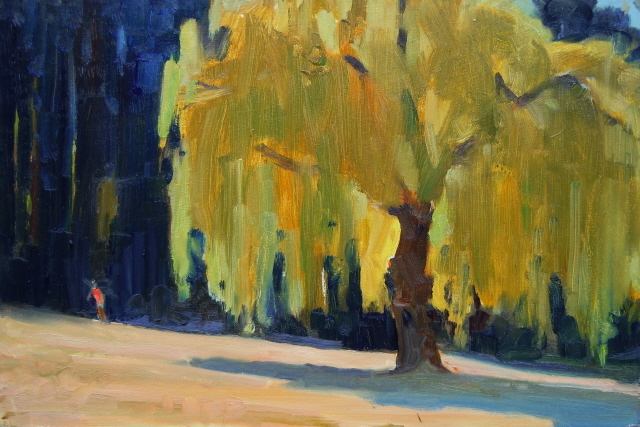 I set up in the shade for my first painting at Jim Lamb's PA workshop in Kirkland. It was a beautiful day promising to be very hot and lots of folks were coming to the park. 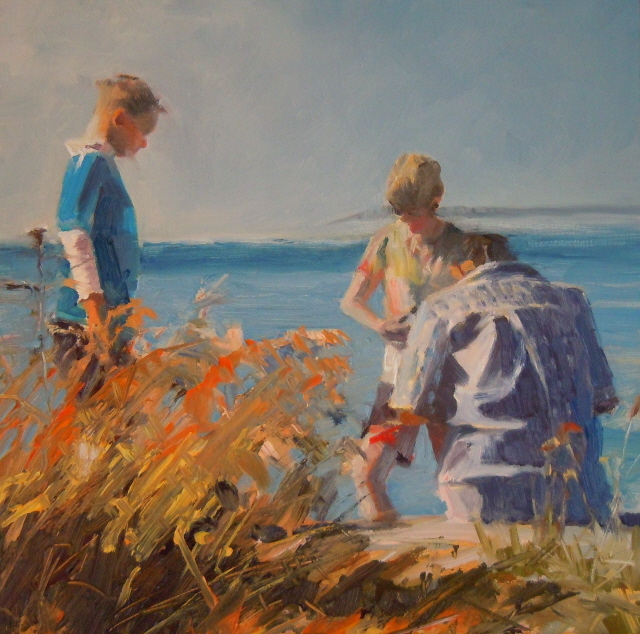 I tend to have a hard time painting figures into a plein air painting so I made a point to try and get them in this one. Jim gave me some good advice about adjusting values and a good tip that "rich ,saturated color(in the foreground and around the focal point) reads sunny day". I tried to get one more quick 5x7 done at the end of the day. Sometimes these quick sketches can be the best ones, This one seems to be a bit washed out and flat. 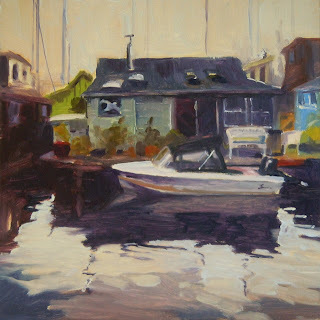 Overall a great day of painting with good friends, Emiliya, Janet, Dianna, and our excellent workshop host Jim Lamb! 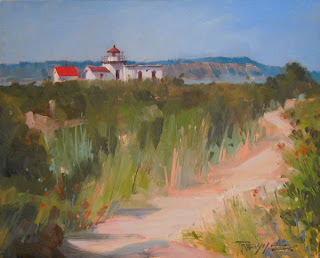 I attended another plein air class with Jim Lamb. Along with three other artists, we spent the day at Juanita Bay Park in Kirkland Washington painting on a beautiful sunny, summer day. 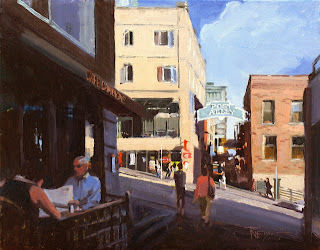 One of the tips I picked up from Jim was to look for a backlit scene in the middle of the day when the sun is high. 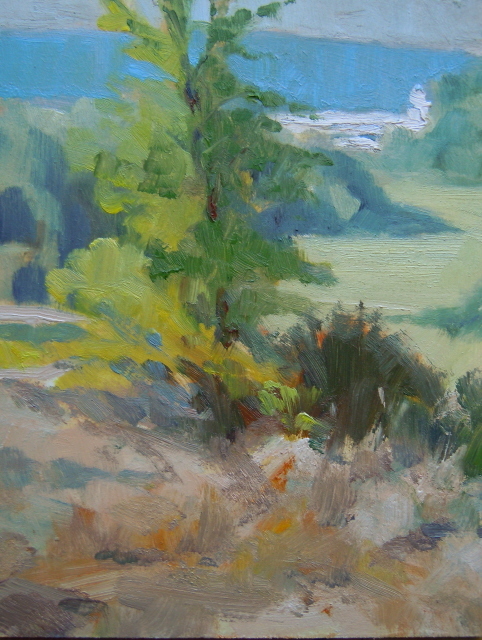 The last in this little series of Point no Point paintings. 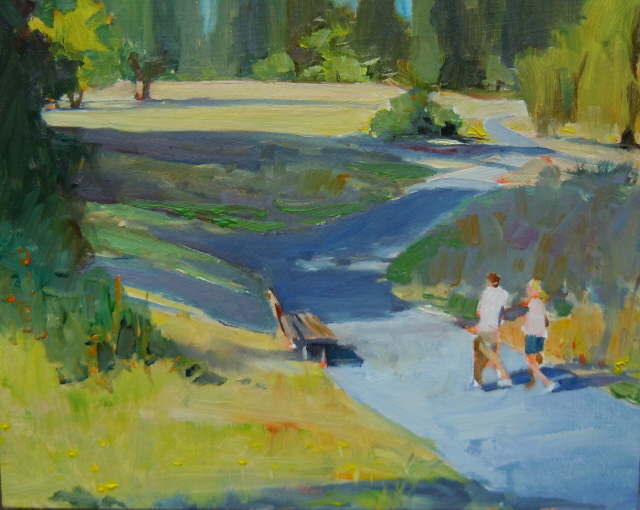 I painted this one from a photo I took while plein air painting in this spot a few weeks ago. It was early morning, the tide was out and just a few folks were walking on the beach loving the fresh sea air and the quiet peace of early morning. 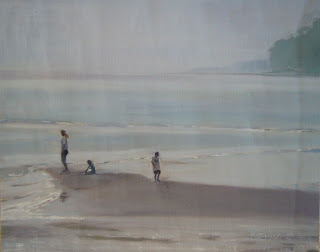 You can see a few wrinkles in the canvas as I painted this on loose linen. I will have it mounted on Gator Board and then framed. Labels: figurative oil painting, Point no Point. marine landscape. These boys were getting a lesson from dad on how to rig a salmon lure. Sometimes it's elbow to elbow down at the Point no Point beach during salmon season. Especially on a day like this one! Another view from my favorite spot to paint! 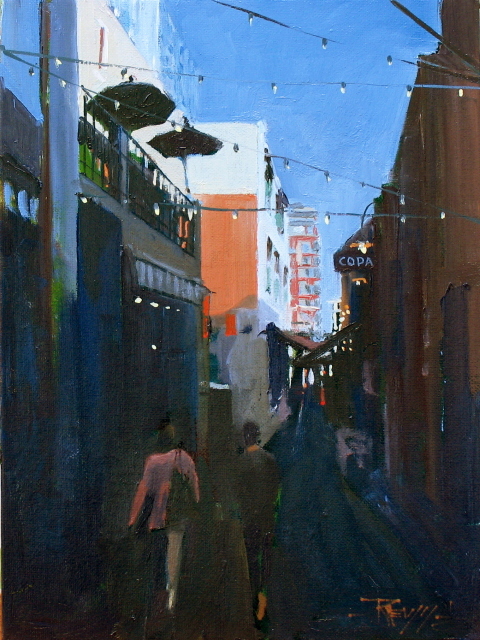 Still using (and loving) the three color limited palette. 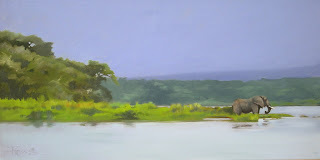 Heading off to paint PA with Jim Lamb today. If you have never seen his amazing work check it out here. 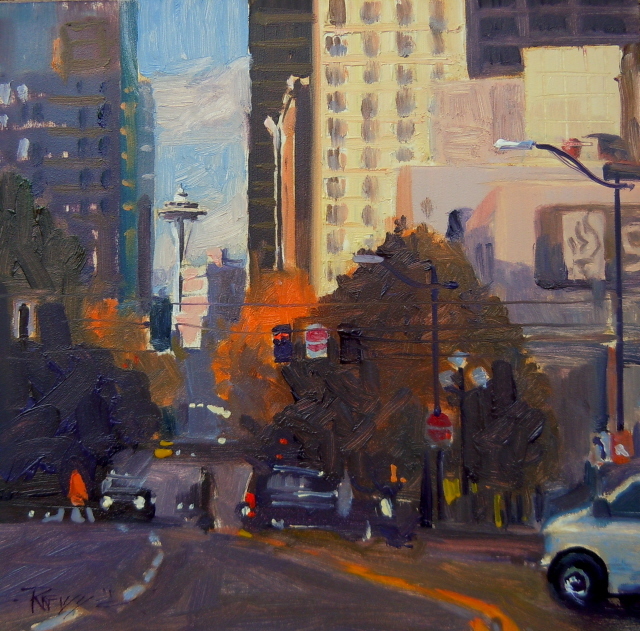 "Needle View" Space Needle, Seattle city scenes in oil. All over Seattle you get these peek-a-boo views of the Space Needle and you know exactly what city you are in. This one is from down by the stadium looking north. FYI ..Fellow daily painter and founder of Daily Paintworks, David and Carol Marine have lost their home in a terrible wild fire down in Texas. A family member has started a fund to help them out. you can get more info here. 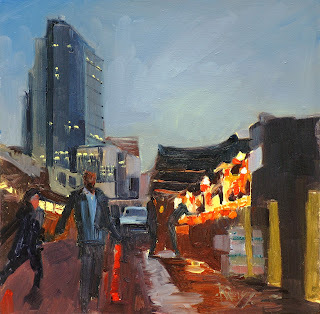 Daily Paintworks has started an Artists Challenge to benefit those suffering in one of the worst droughts in recent history on the Horn of Africa. This challenge has a special meaning for me as I visited my wife in Uganda when she was serving as a nurse in the clinic at New Hope Kasana .You can see my posts from that time by clicking here. 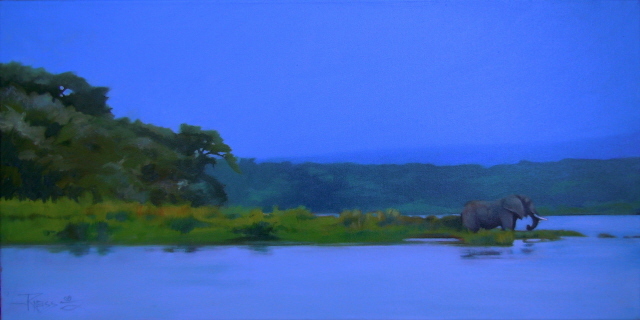 I have decided to donate this painting to the challenge and will give 100% of the proceeds minus shipping to World Vision, who are doing great work to ease the suffering in this part of Africa and all over the world. To go to the Daily Paintworks auction and bid on this painting click HERE. There is an amazing variety of great scenes to paint around Lake Union in Seattle. We were on our way to visit our friend Emiliya Lane who owns the cool and eclectic gallery/gift shop called Frank and Dunya, in Freemont. We stopped to take some pictures of the boat house's on Lake Union. I'm still painting with the three color palette that I experimented with in the Jim Lamb workshop from a few weeks ago.....I think I will stick with it for now ....so much easier than trying to sort through all those colors!